Bob Morrisey started Wine Spectator as a labor of love and guided its growth for three years. Bob Morrisey had a dream--to create a wine publication that would serve consumers and the wine industry alike at a time when the California wine industry was going through a growth spurt. In 1976, he acted on that vision, founding a San Diego-based tabloid newspaper called The Wine Spectator. 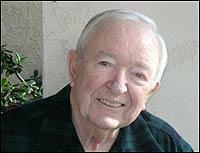 Morrisey, who owned the publication until 1979, died of congestive heart failure on March 26, in San Diego. He was 78. "He was trucking along and had an episode where he couldn't breathe and was taken to the hospital," said his daughter Michele Morrisey. He was diagnosed with congestive heart failure and died peacefully, with his family at his side, she said. "Bob was the original visionary who saw the possibilities of the Wine Spectator's future," said Marvin R. Shanken, the magazine's editor in chief and publisher. "He had the faith to sacrifice whatever was necessary to keep it going in the early years. His smile and warmth will be missed by all of us." Outgoing and upbeat, the energetic Morrisey and his wife, Mary Jane, guided The Wine Spectator from its humble beginnings as a thin, twice-monthly newspaper with an inaugural print run of 3,000 copies. "For the few of us who struggled to launch the original 12-page tabloid newspaper on April 1, 1976, it was no April Fools' joke," Morrisey wrote in the 20th anniversary issue of Wine Spectator. "It was an undercapitalized commitment. Of necessity, it had to be a labor of love, and we ignored the few detractors who insisted Wine Spectator would never make it." Under Morrisey's nurturing, the fledgling newspaper earned the respect of both consumers and industry members for its straightforward, unpretentious approach. "Bob Morrisey had a marvelous vision for a great wine magazine," said Robert Mondavi, who in 1976 was just beginning to convince his Napa Valley neighbors that they could build a reputation for world-class Cabernet. "We're all proud of what he accomplished." One of Wine Spectator earliest fans was Shanken, the New York publisher of the beverage-industry newsletter Impact. In 1979, Shanken became owner and publisher of the magazine, at Morrisey's request, and provided it with the financial resources to expand. "Indeed, our dreams and hopes for Wine Spectator 20 years ago have been fulfilled," Morrisey wrote in the anniversary issue. Born in Wheeling, West Virginia, and raised in Joliet, Ill., Morrisey joined the U.S. Marine Corps at the age of 17, seeing service in World War II, and retired from active duty in 1967. During his 25 years in the military, he served as a combat correspondent and a public information officer, among other positions, and rose to the rank of major. He then worked in public relations and as the San Diego Evening Tribune's weekly wine columnist before starting Wine Spectator. In 1977, he also founded his own marketing communications agency, The Morrisey Group, which handled aerospace/defense clients and, later, wine industry accounts. Morrisey is survived by his sister, Jan Gordon, and daughters Kathleen Cueva and Michele Morrisey. His wife of 54 years, Mary Jane, died earlier. A memorial service in San Diego is pending. In lieu of flowers, donations can be made in Morrisey's name to the San Diego County chapter of the U.S. Marine Corps Combat Correspondents Association, 4970 Frink Ave., San Diego, CA 92117. Or donations can be made in honor of Morrisey's beloved dog, Molly, to the Westie Rescue Organization, Attention: Elaine Delgado, P.O. Box 454, Corona, Ca, 92878.